The Astros have gone into full rebuilding mode over the last few seasons, and one of the beneficiaries of their retooling has been the Braves. They acquired leadoff man and center fielder Michael Bourn at last year's trade deadline for a package of four young players, though he was unable to help them get to the postseason. As an arbitration-eligible player, Atlanta retained his rights for 2012. The 29-year-old Bourn and the Braves settled on a one-year deal worth $6.845MM earlier this week, avoiding an arbitration hearing during his final year of eligibility. He's scheduled to hit the open market after the season, and will represent the one legitimate center field/leadoff hitter type in the free agent class. Bourn won't get Jose Reyes or Carl Crawford money, but he's poised to land a sizeable multiyear guarantee with another strong effort this coming season. Though he hit just .278/.321/.352 in 249 trips to the plate with the Braves following the trade, Bourn had his best offensive season in 2011. He hit .294/.349/.386 overall and stole 61 bases, the most in all of baseball and for the third straight year, the most in the National League. His defense is highly regarded as well, with a +22.9 UZR over the last three seasons. In terms of wins above replacement, Bourn has been worth between 4.2 and 4.9 wins in each of the last three years. His 13.8 WAR since the start of 2009 is the eighth most among all outfielders. Juan Pierre's five-year, $44MM contract with the Dodgers gives us an idea of what a high-end center field/leadoff hitter type can get on the open market. He hit .298/.343/.383 with eight homers and 160 steals in the three years leading up to his free agency (age 26-28 seasons), while Bourn has hit .283/.348/.373 with seven homers and 174 steals in the previous three seasons (also age 26-28 seasons). Pierre got caught stealing more often (61 to 38), but Bourn struck out more (389 to 118). Pierre's defense was also a notch below Bourn's (+8.9 UZR from '04-'06). It's worth noting that Bourn is a Scott Boras client, and earlier this month we heard that the two sides had not yet begun discussions about an extension. It's been five years since Pierre signed his contract with the Dodgers, and adjusting up a bit for inflation indicates that five-year, $50MM extension would make sense for both Bourn and the Braves. Atlanta lacks a long-term center field solution in their farm system, but luckily they already have one of the game's best players at the position in the prime of his career at the big league level. Whether they try to keep him beyond this season is another matter. Word. I’d be alright with Bourn in center for a few more years. I don’t know about five though. 4/42 get it done? At first glance, I agreed with you, but I think five years would be fine. 2012 will be his age-29 season, meaning that a five-year contract would end after his age-33 season. That’s not bad, and it’s not getting into the years when he should be seriously declining yet. If they can get him for $50M over five, Wren should go for it. scott boras would compare him to rickey henderson…. *scott boras WILL compare him to rickey henderson…. If 4/42 gets it done, it’s because Bourn decided that Atlanta is where he wants to be, period, and told Boras to take a hike. The Phillies won the 2008 World Series, so much of what I am about to bring up is moot. But……if that did not happen, trading away Michael Bourn for Brad Lidge, looking at Lidge’s entire time (08-11) with the Phillies, versus what Bourn has done since then…..that would have been one horrible, terrible, down right ugly trade for the Phils. The Phillies also wouldn’t have had either Vic or Werth starting in the OF then either. More likely scenario would have had Bourn as the 4th OF so he never would have showcased his value as he had in Houston. Much more to the trade than just Bourn for Lidge. Actually, more than likely they would have never signed Ibanez, which would have been a good thing. And when you say that there was much more to that trade, you are right, I stand corrected. Eric Bruntlett. Clearly the Phils won that one. Could you imagine a team with Victorino, Bourn, and Rollins (when he was reliable)? The speed on that team would be unbelievable. Can’t go too many years with him, speed is his main quality and that’s always the first to go. A 4/40 should get it done. Not true at all. Fast players always age faster than sluggers. I can’t name any fast players that have a productive careers as older players, but I can name plenty of sluggers who can. There’s been studies on this, so go read one of them before you use a simple litmus test to change all of baseball. Have you never heard of Rickey Henderson? Lou Brock, Tim Raines, Joe Morgan, Kenny Lofton, Ty Cobb, Ozzie Smith, Roberto Alomar, Paul Molitor. Any better? And what’s the one tool Pierre has consistently had no matter his age? Speed. “As players age,” James relayed in an e-mail, “their hitting skills decline and their speed decreases, which creates a kind of pincer movement that ultimately snaps careers. The number one thing that drives players out of the game is the loss of hitting skill, but the number two thing is the loss of speed. “As players slow down they become less able to play the key defensive positions — center, right, shortstop — and get pushed toward the positions for slower players, which are also the positions for big hitters. THE thing that drives them out of the game is not the loss in hitting ability in absolute terms. There are dozens of 37-year-old first basemen who could still hit enough to play — if they could play the outfield. When their speed drops below a certain level, they’re no longer able to play the outfield at a decent level, no longer able to hit enough to be a cleanup hitter, and they’re gone. that’s because old speedy players can still play defense, old sluggers can barely handle 1B. On bat alone, sluggers > burners, but overall, burners outlast sluggers in many cases. Coco Crisp and Ichiro are both older and still fast. Ichiro has lost a step, but he still stole 40 bases last year. I could go on. All of these players continued or extended careers largely due to their fleet-footedness. The only thing a burner needs to do to stay in the game is play average defense and continue to hit north of .270. Slower sluggers only extend their careers if/when they are able to move to 1B/DH. Eventually they get supplanted at 1b too when their range and hands don’t stack up against some other masher that is a natural 1B. 5/50? Pull the trigger Wren! I really hope the Braves give him an extension of 3-4 years. can you explain why this is false? Unless the Braves make an insane offer I don’t see how Boras doesn’t let him play out the free agent market. The “false” part is the $20mil a year! you know who scott boras is right? Jeff Weaver has stolen 60 SB in a season? C’mon, man! I understand it’s Scott Boras, but please give a comparable and not some never-was pitcher that never did anything but cheer on his little bro to success. This article considers top dollar returns. I’m not saying 5/50 will get it done, but somewhere in that vicinity. Bourn is not Carl Crawford…and even if they were similar, Crawford’s play in BOS would almost be a negative comp to Bourn. Makes more sense, but still is irrelevant. Jered grew up, went to school, etc near LAA. That’s as hometown as it gets. ATL isn’t naive enough to think that relationship we build on for 1.5 years we’ll be worth the $10M-$15M he might be able to get on the open market by taking a “hometown discount”. I hate when cheap clubs try hide behind this, expecting it to have much value past a chuckle during negotiations. He’d get $20M per if he were signed on a 1-year deal, maybe. I don’t even see that happening. He’s not putting up Ellsbury 2011 numbers (HR plus SB plus GG-caliber defense). At most I could see $15M per for 4 seasons, but I’d think Boras would want a 5th-guaranteed year…and he’s not getting $15M AAV for 5 years. I’d think more like $12.5M for 5 years…and that’s a significant raise from Juan Pierre’s deal years ago with CHW. Did the fall off the turnip truck hurt? There’ll be OF depth in the free agent in 2013. If we can’t re-sign him, then Victorino or BJ Upton would suffice, though I’d prefer Bourn. He’s a a very underrated player! Baby he was Bourn to Run. Okay that phrase was funny the first 1000 times I heard it. Sounds like you’ve been talking to too many people about Michael Bourn, then. He’s not all that interesting. I’d extend him and work on getting some power at the corners. The free agent market for OF next year is long. He’s perfect leading off for a team that otherwise has very little speed. He was a major upgrade in center. Wren fixed the leadoff problem, dropped some dead weight, and has done a great job rebuilding the bullpen and rotation. Now he needs to add some offense. The Braves need to start hitting with RISP and give the pitching a break!!!!!!! so you mean Prado and Heyward just return back to their 2010 forms and not what they were in 2011? Why wouldn’t it happen ? Last year was the worst year of Prado’s career and was hampered by a staff infection . Heyward was injured again last year also and didi his best to try and play through it after being called out by Chipper for a lack of toughness . The chances of them turning back into the 2010 form are are very possible . Not his year , anyway . But next year if Prado is still on the team , he will be moving to 3rd which will leave a whole in LF . And other than Swisher , Eithier and BJ Upton , the OF list for FA’s next year is pretty thin . And the only one of those under the age of 30 is Upton . Don’t forget about Uggla basically missing half a season…. If Wren can convince Bourn to convince Boras that 5 years for $50M on a team will that will be contending year in and year out , then the Braves might have a shot at getting this done . With Chipper and Lowe’s contracts coming off the books next year and a lot of our guys still going through arbitration over the next several years , we should be able to sign him without it hurting our pockets . With Chipper and Lowe’s contracts coming off the books and a fair number of players still in arbitration, Boras is going to salivate like a Saint Bernard at all the money Atlanta will have available to pay his client. But that doesn’t mean that we will give in . I’m all for keeping him if it’s a fair deal for both sides . If not , than we may have to look at other options for CF like Victorino or Upton in FA next year or someone through trade yet again . Our only internal option are Myke Jones and Jose Constanza . Not much talent there . I imagine Victorino is going to be more expensive than Bourn. So if they’re not willing to extend Bourn, chances are Victorino is already off the table. I don’t think he leaves Philly anyway…. I can’t see Vic being more expensive than Bourn/Boras. Victorino is 1.5 years (appx) older, his defense isn’t as good, and while he has more power, he doesn’t steal nearly as much. PHI will have some $$$ with letting Hamels walk. I agree that Atlanta shouldn’t necessarily give in. But not giving in could very well cost them a top-notch CF. Bourn is not a franchise player, but he certainly sets up nicely as a major piece. It could behoove ATL to slightly overpay for him if they can use him as part of a long-term foundation. If they aren’t paying for Bourn, they likely are not affording Victorino. Upton won’t be coming cheap either, though he should cost less than Bourn. Todd Cunningham is the highest on the depth charts. Constanza is only considered for 4th OF and mainly corner OF gigs. Cunningham needs some time to be consistent in the minors, but he’s good stuff. Cunningham AT BEST will end up being a 4th OF who will occasionally back up CF. Some scouts have projected him to be what they call a “fringe” CF who is better suited as a corner OF. Looking up and down the organization, Matt Lipka is the best CF option in the minors but since he was just converted from SS, he is a minimum of 2 full seasons away from a big league debut if not 3. I didn’t know what the time-table was on Lipka. I know his offense equates to a CF, but I wasn’t sure about his defense. We have got to get more OF prospects. It looks as if we may end up with…a Bourn Ultimatum. The great inefficiency in the market today – speed and defense. A 4 WAR player signing for what a 2 WAR player would normally get? You build a team around acquisitions like this and you’ve got a very good team on the cheap. 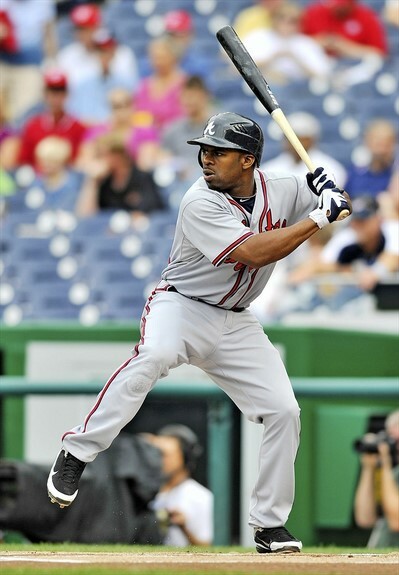 Bourn is the type of player the Braves need most right now- a good OBP, good defensive CF. Braves have a bunch of flyball/SO pitchers, so OF defense is important. Prado/Bourn/Heyward may be the best defensive OF in the NL next year, and if Heyward and Prado rebound like they should, a pretty decent offensive unit also. I wouldn’t want to be a GB pitcher in ATL anytime soon though- that infield defense is scary bad with Chipper/Uggla/Freeman and no A-Gon. No need to call out Freeman here. He may not have the best range in the league, but he’s certainly not a liability on defense. One year of sketchy defensive metrics aren’t all that relevant to me. I watched that guy play at least 100 games last year and was pretty impressed with how he handled himself on defense. Like I said, he’ll likely always have limited range but he’s at least league-average. No argument on Chipper or Uggla, although Chipper could be gone after this season. I kinda wish the Braves had been able to keep A-Gon one more year, but he wasn’t worth the $3mil it would have took. Best defensive OF is probably Arizona, but that is a nice starting 3 for sure. I’d love to see Bourn on the Cardinals, I’m not the biggest Jon Jay fan, and besides Furcal is an awful leadoff hitter. Furcal is the reason we’re going to pay Bourn his money. My concern would be Bourn turning into Juan Pierre. The Bourn Identity: his real name is Fausto Carmona. He’s was traded to the Braves and will leave a free agent like so many other former Braves that stopped for a cup of coffee before signing elsewhere because that’s what always happens.